Samsung Electronics has sent out invitations to a June 12 event in New York, at which the company is expected to launch new Android tablets. 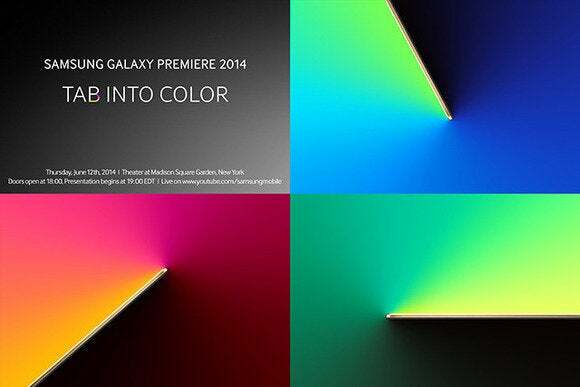 When vendors send invitations they usually include hints at what they plan to announce, but beyond saying “Samsung Galaxy Premiere 2014, Tab into color” Samsung is tight-lipped about what its plans are. However, it can be deduced that the company is launching tablets, since Tab is the brand Samsung uses for products in this category. The reference to color and the invite’s design hints that it will be a colorful bunch. Earlier this week it was also reported that Samsung is working on three new tablets, including one with a 13.3-inch screen and a 2,560 by 1,600 pixel resolution, according to GSMArena. Samsung has already stretched the screen size of its tablets to 12 inches with the Galaxy Tab Pro 12.2. Similar to its strategy in the smartphone segment, Samsung has tried to best Apple with a plethora of different models. When counting units, that has been a successful strategy. During the first quarter, Samsung shipped 11.2 million tablets, a 32 percent increase year-on-year. Apple is still bigger, with shipments totalling 16.4 million tablets, but that’s down by 16.1 percent year over year. Samsung continues to work aggressively with carriers to drive shipments of tablets by offering them in packages with smartphones at attractive prices, IDC said. This isn’t the only event Samsung is organizing in the coming weeks. The company has also sent out invitations to a May 28 event in San Francisco, at which it is expected to expand its health-related offerings.